Vinegar battery from copper wire & nails | DIY electricity! May 20, 2012 January 6, 2018 - 38 Comments. Always wanted to make your own battery? Home brew electricity! Maybe you already heard about salt water batteries made from sea water, but this is something you can easily do at home in a few minutes. This homemade vinegar battery is based on two different metals suspended in an acid solution. Produce electricity from vinegar, which acts as the electrolyte! Electricity is generated by reaction of the two different metals (the electrodes) with the vinegar (the electrolyte). So you can just place two different kinds of metal in a conducting solution and that’s it, you get a battery! 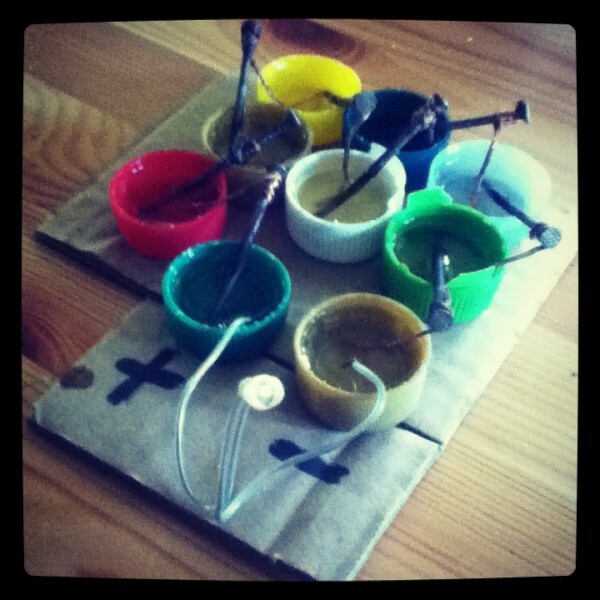 You’ll need two different kinds of metal, for example copper and zinc and some acid liquid. The electrons travel from the – through the electrolyte (acid) to the + and creates an electric current. The copper wire you can get from for example an old (or new) power cord. You can do this with one, or -in my case- 9 bottle caps. Fill the bottle caps with vinegar (no vinegar? Try it with lemon, orange or apple juice or whole lemons). Doesn’t have to be to the rim. If you have stripped the copper wire from the power cord, cut it in about 2 inch pieces (about 5 cm.) and tie one end to a nail. If you have 9 caps, repeat this with 8 other nails. When you’re done, put one end of a copper wire in one cap, and the nail which is tied to it in another cap. 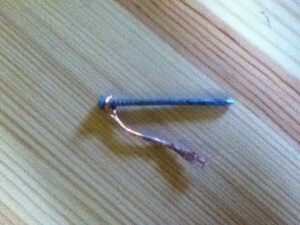 Then take another nail and put the nail in a new cap and its copper wire with the nail from the first one. Don’t let the metals touch each other (it won’t electrocute you if it happens, there is hardly any current to produce any sparks). Serial battery for more power! You’re now basically wiring a serial battery. Every cap with a nail and copper wire is one vinegar battery! So now if you’ve done that, your battery is reading for use. So the first cap has a nail and the last one a copper wire. If you have a multimeter, hook it up to see how many volts you’re getting. Now, mine showed a voltage of around 4 volts. Not enough to run your fridge with it unfortunately, but I found a LED somewhere from an old garden light and hooked it up. It’s still burning after 4 days! You can try making diy batteries with all kinds of stuff, I got 0.5 volts from buttermilk and icetea. Salt water also works. If you connect a Joule Thief to it you might actually charge a battery with this one! You need an acid powered gift? Then you might be interested in one of the following science kits, available on Amazon for just a few bucks. Run a LCD clock on a lemon or potato! My son and I are doing a ice tray battery with similar steps. It is not working and I cant figure out why. Ice trays are perfect for these experiments. Make sure each ‘cube’ is not too full, because the liquid in each mustn’t touch the other liquids otherwise you’ll have a ‘short circuit’. Also the LED must be low-voltage. I’ve used one from an discarded garden light (one which had a solar panel). Hello there the type of circuit that you have is series, isnt it? my question, is it possible to apply it in a parallel circuit to obtain more value of current instead? Absolutely! You can use this setup like a normal battery with plus and minus. Just connect a few serial circuits in parallel. can a vinegar light a bulb? Only a very small bulb, like a LED. is it possible to make a vinegar battery without multi meter? You mean how long it’ll burn? I got it glowing for more than a week! Could be more even but I stopped the experiment before it stopped glowing. I gone thru all the steps, but it didn’t work. The vinegar I used was form the cooking shelf. Is it matter the vinegar used? It should work, because it also works with water 🙂 try and see if there is no short circuit somewhere… If you have a volt meter, measure the voltage between the different ‘batteries’ (caps) this way you can find where something is wrong. Or maybe you have a bad LED or you have to change the polarity of the LED. can you help me on my SIP by answering these questions please? What is that backround of study,Hypothesis,Significance of the study,Scope and Limitation, and its recimmendtion. please I’m waiting for your help .Hurry thanks! what if it fails? i used the extracts of Averrhoa bilimbi and Calamansi but it didn’t light the bulb. After it i saw the nail covered by the copper wire corrode can it be possible that it is the reason why the bulb didn’t light? Exactly, the copper wire mustn’t touch any other nail. That’s not true, the wire can touch other nails. It is the fact that your wire or your nail were corroded. 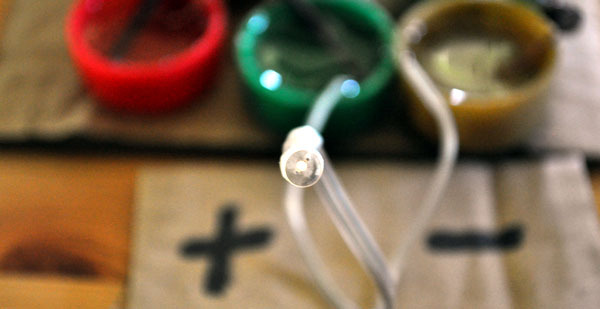 If you can’t get the bulb to light, then find a different nail and use 18-gauge copper wire. Since the copper wire is a good conductor, then if you tried to use a different liquid with a different acid level, then the experiment might work out better than it did the first time. what do you mean about “Then take another nail and put the nail in a new cap and its copper wire with the nail from the first one.” I dont understand it. Isn’t it too expensive??? Pls rply fast..
Not at all. Bit of vinegar and a few old nails and some other old metal and you’re done. Depends on the materials and liquids used. I can’t remember how long this one lasted but certainly a week. If you look closely you can see the + and – of the LED just sticking in the liquid. do I need to replace the copper and nails after 4 days to make it work again? You can try cleaning them first, so wipe the corrosion off and you can use the same copper and nails. what is the role or work of vinegar in this circuit ????????? Would cleaning vinegar be a better electrolyte than white vinegar? Good question! Worth trying out. If there is a difference (more volts/amps), we have to find out what the difference is between the two vinegars. Is it possible to make a unit large enough to power a house during a power failure? Would several cells be a better approach? How would one compute its size and that of the copper and zinc rods/plates?